1. Promise nothing. Just do what you most enjoy doing. 2. Sign nothing. Just do what doesn’t require a signature of any kind. 3. Offer nothing. Just share what you have with those who express an interest. 4. Expect nothing. Just enjoy what you already have; it’s plenty. 5. Need nothing. Just build up your reserves and your needs will disappear. 6. Create nothing. Just respond well to what comes to you. 7. Seduce no one. Just enjoy them. 8. Adrenalize nothing. Just add value and get excited about that. 9. Hype nothing. Just let quality sell by itself. 10. Fix nothing. Just heal yourself. 11. Plan nothing. Just take the path of least resistance. 12. Learn nothing. Just let your body absorb it all on your behalf. 13. Become no one. Just be more of yourself. 14. Change nothing. Just tell the truth and things will change by themselves. 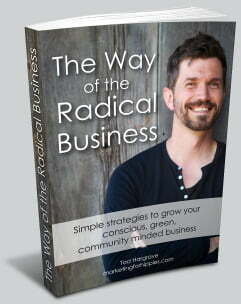 my fancy new ebook “Marketing for Hippies” when it’s done. require a signature of any kind. reserves and your needs will disappear. and get excited about that. absorb it all on your behalf. and things will change by themselves.